In any satcom system, there is a need to test the path of the data from end to end to ensure that the bit error rate (the amount of errors) is minimal or error free. We use test sets to send test data across the system where it can either be received and analysed by a compatible test set for one way testing or looped round and sent back to be received and analysed by the same test set. What the test sets are looking for is errors in the received data. Since they know what was originally transmitted they can accurately monitor errors in transmission. If you have sent 1,000,000 bits of data and receive 1 error then that is an error rate of 1 in 1 million bits or 1 x E-6. Acceptable error rates start from 1 error in 10 million bits or 1 x E-7. To measure this kind of error rate accurately the tests have to run over time to build up a statistical picture of the errors. 1 error in 24 hours and then 2 million in the next 10 minutes is not a good link but for the first 24 hours is was a superb link. 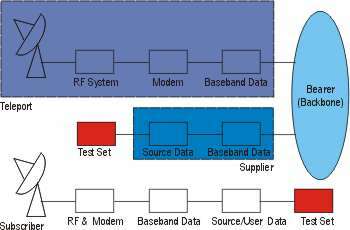 Eb/N0 is a specification of the satellite modem which states the size of the signal for a given data rate to give a specified bit error rate. It comprises of the energy per bit in a 1 Hz bandwidth. In order to calculate this we need the data rate. We simply subtract 10 Log this data rate from the measured C/N0 to give the Eb/N0. The modem manufacturer states the Eb/N0 for a given data rate so you can easily know the required C/N0 to acheive this.